How will the summer conclude? 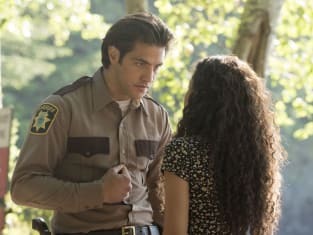 Dead of Summer Season 1 Episode 7 darkened things up even more as Amy was kidnapped and used as a sacrifice for the lake demon, something that almost killed her and killed all of the cult. Well, almost all. Unfortunately for Garrett, his father's best friend was the Teacher, and his murderer. 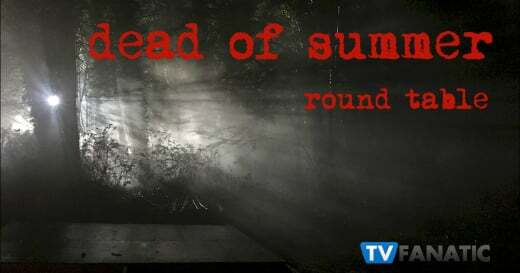 TV Fanatics Allison Nichols, Yana Grebenyuk, and Caralynn Lippo discuss that not-so-shocking reveal and their predictions for the dead end of summer. The Sheriff was the Teacher? Was anyone surprised or unconvinced? Allison: It was really, really obvious. I wasn't really surprised. I did like that he got involved in this satanist cult or whatever you want to call it because it provided him power. Being a townie in a small town didn't empower the Sheriff, and the power is what seduced him. Yana: Nope. For once I was right and I knew it since the moment the episode started. He didn't have to be there in every flashback but he was so it was only a matter of time before he slipped up and clued Garrett in. And his reasoning was way better than what I thought it would be, not having much power is much more realistic for this kind of show. Caralynn: I didn't expect it prior to this episode but "Townie" made it really, really obvious. The Sheriff conveniently vanishing when Amy was taken was the icing on the suspicious cake. React to Damon and Garrett being friends. Allison: It was an interesting realization. I enjoyed the flashback where Garrett was the kid urging Damon to break the rules and beat up the principal's car. It was unexpected. Yana: I wish they were ex boyfriends but that's never going to happen so that was a nice substitute. I agree with Allison that the first flashback really wanted us to assume that those two were exactly the same when they were children so the reveal would be that much more crazy. Caralynn: That was a neat twist and helped to provide some depth to Damon, who was a rather one-note sort of villain before that. Why was Amy chosen as the vessel for this demon? Allison: I have no idea. How was she hypnotized or put in a trance? Does it have to do with the fact that Amy's never been to the camp before or is it because of her family? I have a lot of questions. Yana: I don't want to suggest this but I'm going with the good old virgin storyline. Either that or she's just simply the Chosen one. They've done it on OUAT, why not do it here too? Caralynn: UGHHH I really hope it's not a virgin storyline. That's so hokey and overused. I don't even understand how it's even still being used as a horror trope. Maybe it has something to do with her family/lineage? What role do you think Holyoke plays in this situation now? Allison: I'm thinking he isn't involved with the teacher or the satanists. I believe the Sheriff when he said that he/they didn't kill Cricket. He didn't have a reason to lie. I'm thinking there are multiple factions at work here. Yana: I would need to go back and rewatch the scenes where he is referenced. I've been going back and forth between him wanting the spirit to be brought back and not. It looked like he didn't but then we got a glimpse into his past and he was very into this satanic stuff. Could those bodies in the very beginning be sacrifices that he made to the monster? Or were they like Damon and they went voluntarily so they could live forever? Caralynn: I have a feeling that Holyoke did want the demon resurrected when alive but in depth something changed? That's the sense I got. He very much didn't want Amy, the vessel, to survive. 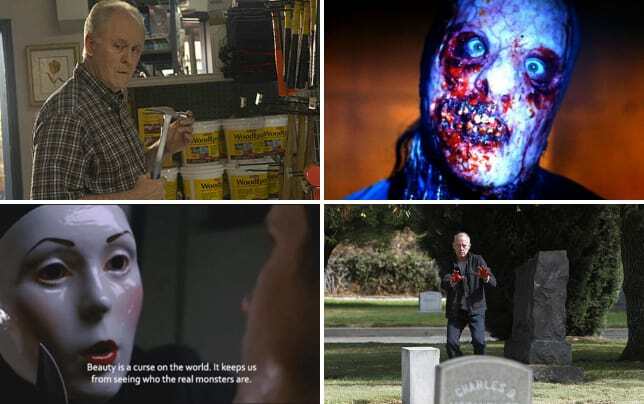 There is definitely some third party at work, like Allison said – someone who is not the Teacher/satanists OR Holyoke, but rather a totally separate person with a resurrecting-the-demon agenda of their own. Predictions for the last three episodes. Allison: I think the demon will rise. Holyoke will do something suspicious/creepy. Anton and/or Joel will have another vision of Holyoke. Someone else will die. There will be some more hook ups. We might even learn that someone else we know and potentially trust is involved with Holyoke somehow. Yana: Holyoke will visit them through Amy and we will get insight into what his motives are in all this. There will definitely be death, maybe everyone except for one or two survivors who will live to tell the story. Or maybe everyone dies and Joel's camera will be the one to show what happened at the camp. But I love Allison's idea of someone we know and actually care about working with Holyoke. Blair's story is being kept back even though he was crucial to the Drew and Cricket plots. I want to know why his flashbacks will be last and if that plays a part in anything. Caralynn: Holyoke will definitely appear via Amy and I think his true motives will be revealed. The demon will probably make an appearance and I think he'll end up being defeated via someone sacrificing themselves – I'm guessing Deb, because that would feel like a very natural conclusion to her "saving the world" dream as a young teen. I can't see any of the remaining counselors dying, except maybe Alex. Sorry, Alex. Be sure to tune into Dead of Summer Season 1 Episode 8, "The Devil Inside," on Tuesday! Jessie: Thanks a lot, Townie. Now, let's go get our girl. Permalink: Now, let's go get our girl.